Panorama of Koh-Tao, the first stop of my journey. It used to be a very remote island not so long ago. Now it's spoiled. But it still remains a diving mecca. In my previous trip (Philippines) I didn't have any means of taking pictures underwater. That's why the first thing I wanted to do was to test my housing for the nex-5 camera. I chose Thailand because it has many famous diving locations. It is very popular among divers, and it's cheap. Besides, jellyfishes are not that abundant there, compared to the Philippines where I got stung numerous times. For 100 bucks the camera housing did its job. But it sucked because of countless reasons. At least I understood why 1.5k $ housings are worth the price... 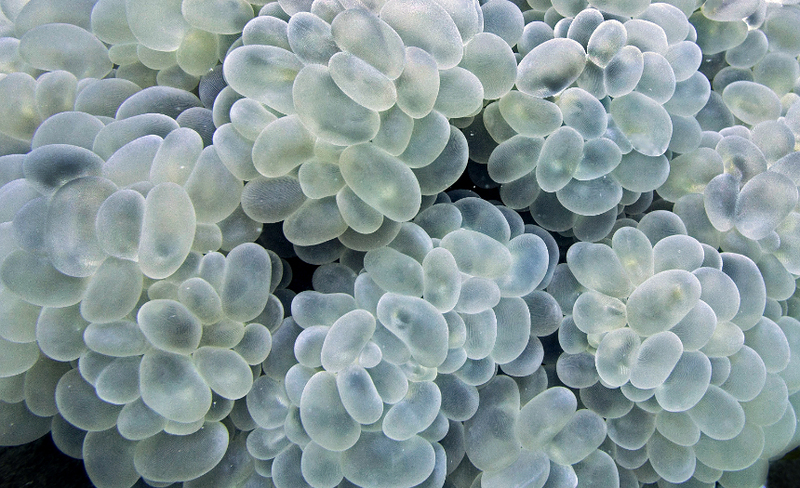 Nevertheless, the desire to take underwater shots made me want to explore around more and seek interesting places. On the right: this is part of a wreck. 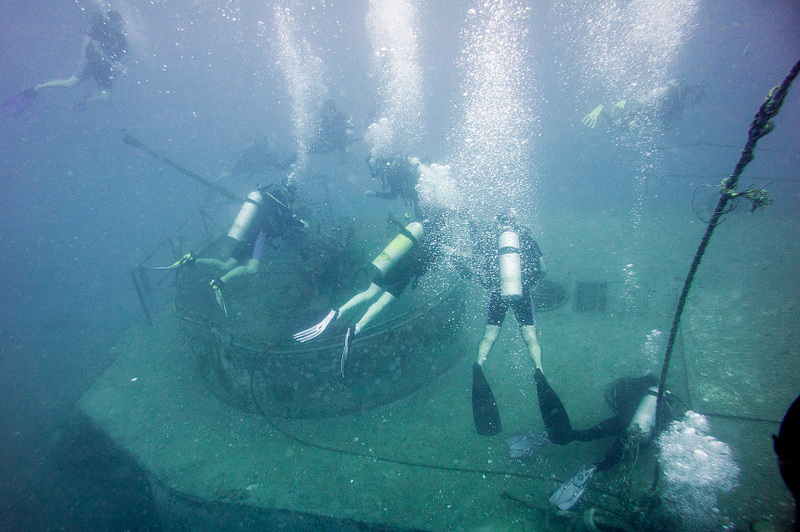 I don't remember if that particular ship was sunk to create a diving attraction or its existence is "natural," but most wrecks are made artificially to attract more people.I am not sure if I can call a sunk ship garbage, but that's one of the peculiar cases where people pay money to see stuff we throw away. While I often couldn't control my camera and its settings, I managed to get some shots from every dive and, besides, I wouldn't miss the opportunity to snorkel and free dive with the camera. I could only mount my wide-angle lens for underwater housing, therefore no hope for macro photography. What do you mean "a canon loaded with fish?" 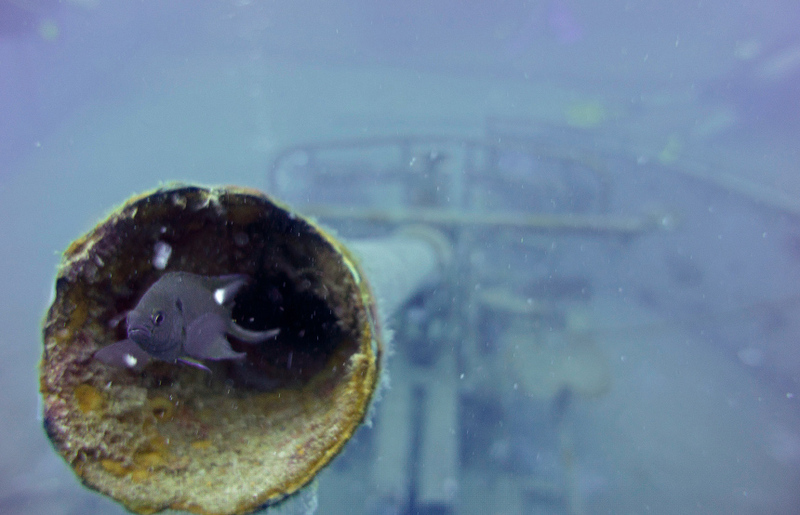 To whoever doesn't get what's on the image: you see a damselfish inside a canon of a sunken military ship. During my stay on Koh-Tao I visited many dive sites around the island, both snorkeling and diving. On my first underwater swims I though that the Philippines were a much more interesting destination. The local diversity just didn't impress me on the first days. I was even pissed off after my first night free-diving attempt: I couldn't see any glowing plankton--one of my favourite sights in the ocean. Fortunately, longer boat trips and visiting remote snorkelling sites revealed that this area is really exciting. Besides, I also tried fluorescent night diving and that was the most memorable, amazing, and outlandish dive that I've ever had. Crown of thorns. As beautiful as deadly... it's deadly only to the corals. 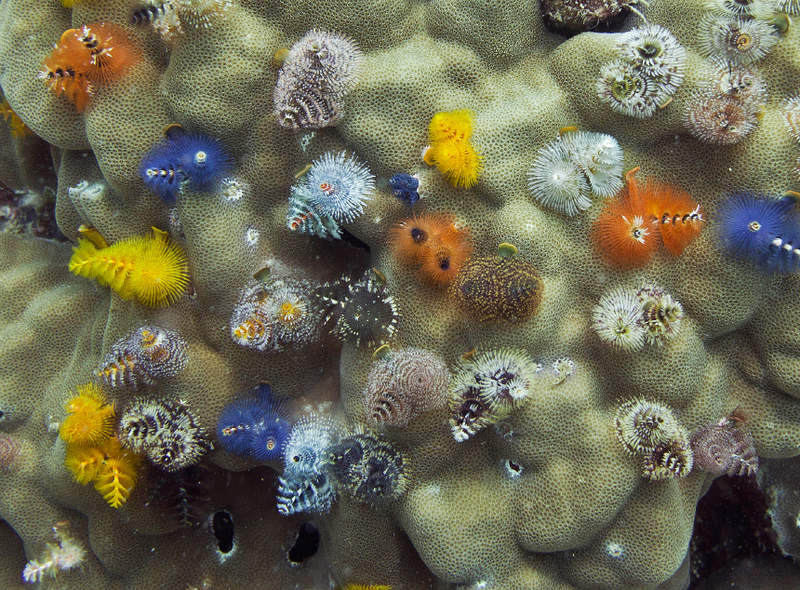 The first thing that caught my attention was the diversity of christmas-tree worms. I've never seen so many of them concentrated on a tiny area. These guys are fun to watch, but I got used to the idea that worms of one colour usually sit together. 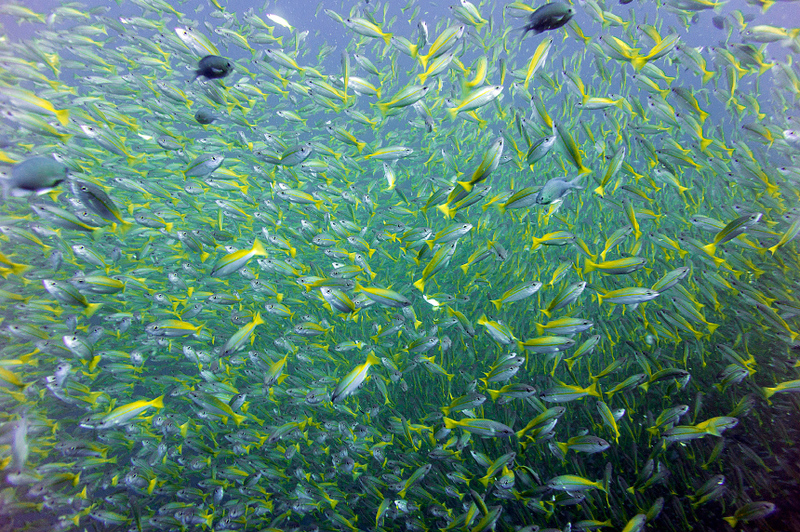 At some spots I was highly impressed by large schools and shoals of Pacific fishes I had to swim through. Unlike the Caribbean, the only big fish round, aside from sharks, was a giant grouper. I was hoping to spot a whale shark and on every dive I was looking at the surface in hope to see the colossal shade of those amazing creatures... Unfortunately, I wasn't lucky enough for that encounter. It's getting harder and harder to see sharks in their natural habitat. 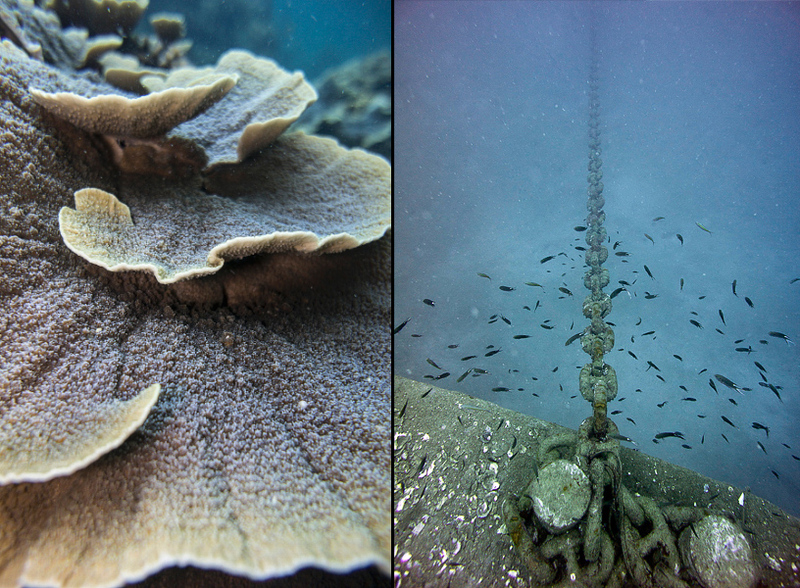 The reefs in Koh-Tao don't look as badly affected by bleaching and different kind of damage as in the Caribbean. 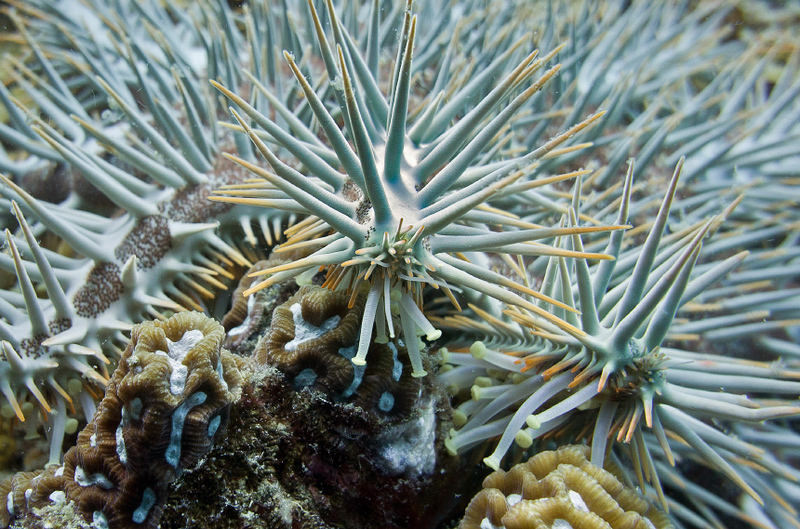 But the massive decline in areas covered with coral ecosystems is very noticeable to me, as for a person who has been trained to see imperfections in visibly healthy reefs and recognize dead corals. 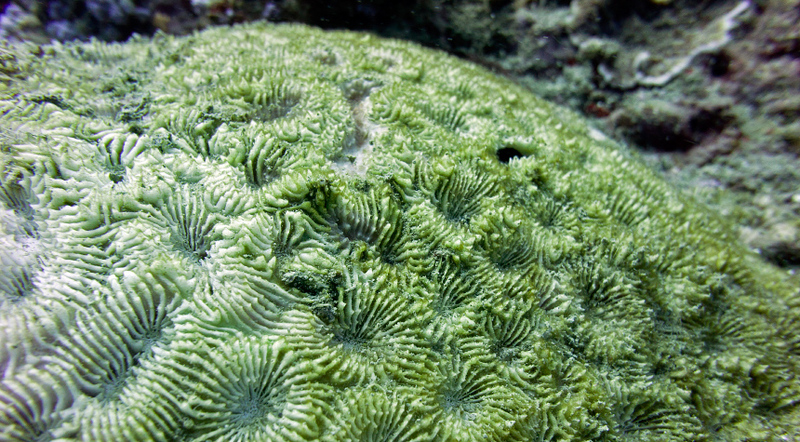 Large areas in populated bays are almost all dead and the bottom is covered with dead corals encrusted with algae. Because of that reason, most of dive sites are situated away from the island. The longer is your ride from the crowded bays, the better the view. But snorkelling near the diving resorts reveals the ugly side of the diving industry. A dead coral. Judging from the white top and almost unaffected structure of the remains, it didn't happen a long time ago. In my post about reefs in the Caribbean I shared my impressions on how rapidly the biodiversity is declining there, mostly because of global changes in climate and in the ocean. In Koh-Tao the picture is somewhat different. The problem originate in us, divers. Divers themselves don't destroy reefs directly, kill fish, or do anything massively wrong (aside from kicking corals with fins and feeding fish). Divers have to live somewhere to get to the reefs. And this somewhere happens to be Koh-Tao, a tiny island whose economy utterly depends on one activity--diving. It doesn't have a developed infrastructure and, of course, not even a sewage system. All the sewage, which includes shampoo and suncream, goes straight into the ocean. No purification, which many parts of Asia are notorious for. There's no recycling or proper garbage management on the island either, although you might find trash bins for different kinds of stuff with recycling signs on them. It's just deception to make you feel like something is being done--all the garbage is gathered in one spot and burned. And if you think of hundred of thousands of visitors per year, the situation becomes clear. I believe the pollution is nowhere near as the situation in the areas surrounding big cities. Yet, that's enough to see that reefs don't need a lot of pressure and "convincing" to go away. I was off season. Yet in some locations I couldn't see through divers. I know the red sea is way more crowded, but after diving in remote areas this looks really messed up. Most of people would consider that visiting reefs does minimum damage: after all, it's just air from your tank that you leave underwater. However, thinking about gas that dive boats use, gas that tank compressors use, gas that has to be spent to deliver gas supplies to dive schools, and finally, the infrastructure on land, I don't believe environmentally-friendly way of reaching reefs is possible, at least in a large scale. Most people wouldn't want to go for sacrifices that those ways involve. However, I wish divers were at least educated about checking if the resort/dive school/whole location does have a decent purification system and cared about such details as where garbage actually goes when it's thrown away. After all, Thailand is not an exemplary country of pollution management and recycling. Perhaps in other countries this kind of impact is not that severe. The nearby island Koh Samui is very dirty. The trash floats in multiple layers even miles away from the land. The cities and villages are much larger than on Tao, and the sewage flowing into the ocean is even stinkier and denser. Looking at the island now, it's hard to believe it used to be a beautiful place not only on land, but underwater too. It has beautiful beaches covered with miles of resorts. But it has nothing underwater. To an average visitor from a big city from anywhere in the world this place might look like a paradise. But for those who have seen really wild and unspoiled locations, it can only induce sadness. Peculiarly, divers, as a group of tourists, are people who talk/hear about conservation a lot. Multiple conservation adds appear on every corner. Conservation groups are not a dying species on the island and I believe they doing a good job in promoting their activity and what they care for. Even more, I think most people coming for vacation are willing to understand the problems. Yet the desire to see the beauty of nature is too strong. And divers usually know the difference between a crappy-looking dying reef and wonderful remote spots rife with life. 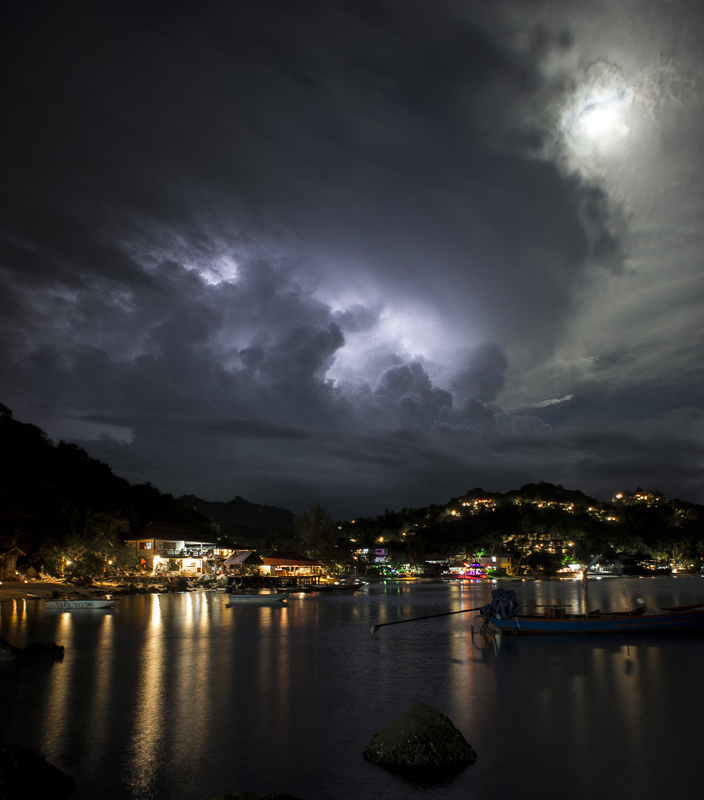 Night scene at the south of Koh-Tao. It's not the most developed area of the island. For every tourist that would appear as a beautiful sight, but freaks like me start imagining raw sewage from every house polluting the ocean. I'm afraid that Koh Tao, which happens to be close to popular resort areas, is doomed to turn into the same graveyard as Koh Samui within a decade or two. There's nothing that can stop the increasing flow of tourists. Perhaps the absence of purification makes many Asian beach areas much cheaper, and installing those is just not prolific. Probably the low prices attract us more than anything else in certain places and the environment becomes secondary. I have never been a fan of regular tourism and I usually seek ways to go to the most remote areas, away from popular destinations. Now I feel guilty about that. My desire to enjoy the beauty of nature is what destroys it. So, is it possible to see a reef without ruining it? Probably yes, with strict environmental management and conscious efforts of every single visiting person and, most importantly, the effort of locals. But I'd say it's science fiction... or even a fairy tale. That renders the answer as no. At least for Thailand. Are conservation people pessimistic and exaggerate existing problems? I think so... sometimes. Will it stop me from visiting places further? No way! But I'll think twice about the trip and check for how unwell local people treat the environment. I'd rather spend twice the price (or even more) to be sure that my visit indeed causes as little destruction as possible. After all, even if we who are involved into conservation one way or another don't show an example, who will?